For the first time ever, all four Division I Men’s basketball teams have made post-season play in Iowa. Leading the way is Iowa State. The Cyclones were a pre-season #8 pick by the Big 12 Coaches, but surprised this year tying Baylor for 3rd place in the league with a record of 12-6. Fred Hoiberg’s squad draws the defending national champion UCONN Huskies in their 1st game in Louisville Thursday. “The Mayor” has done a fine job of putting band-aids on the program bringing in lots of transfers led by former Minnesota recruit Royce White who leads the Cyclones in PPG, RPG and APG. It has fans excited about Iowa State basketball again. If the Cyclones can make 3’s, then they will see Saturday….against #1 overall seed Kentucky. Iowa is on the uptick and is headed to the NIT. The Hawkeyes finished the season 17-16 and hosts Dayton Tuesday night. No negative NIT talk with Hawkeye fans, who see this as a potential step to make the NCAA’s next season. I am most happy for SR Matt Gatens, who’s been a loyal Hawkeye. Glad to see him get rewarded. Josh Parker plays for Dayton. Parker was a member of Drake’s NCAA team 4 years ago. Northern Iowa is making it’s first ever trip to the NIT Wednesday at St Joseph’s. The Panthers and Hawks have one common opponent in Creighton. St Joe’s beat Creighton at home, while the Panthers split with the Jays, each winning on their home court. Like Iowa, I think UNI fans feel that this team could make a run back to the NCAA’s next season as only SR Johnny Moran will be lost to graduation. Drake is back in the CIT for the 2nd time in four seasons under Head Coach Mark Phelps. The Bulldogs played the entire year without Seth Van Deest and Reece Uhlenhopp due to injury and Ben Simons missed a few games due to mono, but Drake still managed to finish in a five way tie for 3rd place at 9-9 in MVC play. Solid coaching job by Phelps and his staff despite injury/health issues. They meet North Dakota Wednesday at the Knapp Center, who is lead by former Iowa Asst Brian Jones. All four Division I Women’s basketball teams are headed to post-season play also. Two teams are headed to the NCAA’s. Iowa and Iowa State. Iowa travels to South Bend, Indiana as the 9th seed against 8th seeded California…with the winner getting top seeded Notre Dame in the next round. Coach Lisa Bluder has done another great job leading the Hawkeyes into the NCAA’s after losing Jamie Printy to a season ending knee injury. The Cyclones are the lower seed (10) and will host UW-Green Bay (7) in Ames. Tough draw for GB having to play at Hilton as the higher seed. The Cyclones are 3rd only to Tennessee and Louisville in WBB attendance. But Green Bay has had an outstanding season and comes in at 30-1. Coach Bill Fennelly and his staff were phenominal getting this team back to the dance after they started 0-5 in Big 12 play. Drake gets a bid to the WNIT. They play at South Dakota Thursday. Northern Iowa will play at Stephen F Austin Thursday in the WBI. Des Moines plays host to the NCAA Women’s regionals. I hope all basketball fans in the area will support this because it might go a long way to getting men’s 1st and 2nd round games to Wells Fargo Arena in the future. 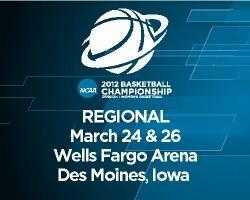 Top seeded Baylor vs 2nd seeded Tennessee would make for a great regional final to attend also.